Effect of various plant growth regulators on in vitro seed germination and shoot organogenesis in Tectona grandis L.f. In the present study efforts were made to enhance in vitro seed germination and achieve shoot organogenesis through different explants of Tectona grandis, a hardwood timber species known throughout the world for its high-value wood. Seed germination was significantly affected by seed inoculation on different strengths of MS medium and different GA3 concentrations. Different strengths of MS media combined with different GA3 concentration significantly affect seed germination in vitro. Maximum seed germination (96%) was obtained on 0.4% GA3 combined with half strength MS medium. 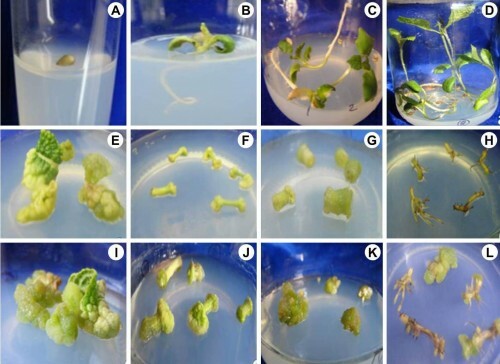 The effect of types of explants (leaf, internode, hypocotyl and root of seedlings), different concentrations of thidiazuron (TDZ) (0.1, 1.0 and 10 μM) and auxins (IBA, IAA and NAA) on callus induction and shoot formation was investigated. After 30 days of inoculation, it was observed that explant type had a significant effect on callus formation. Maximum callus was obtained on internode explants (56.17%) which were statistically on par with callus obtained on leaf explants (54.32%). The effect of TDZ on callus and shoot formation was also observed. TDZ with higher concentration (1 μM) gave maximum callus (48.6%). Whereas lower concentration of TDZ (0.1 μM) was effective for shoot formation from both internode and hypocotyl explants. IAA and NAA were also helpful in shoot formation whereas IBA retards shoot formation. For shoot organogenesis internode was found to be most responsive explant type followed by hypocotyls and leaf. Roots were found to be the least responsive explant. Fig. : In vitro seed germination in seeds of Tectona grandis.